If you’re looking for an easy recipe to make a sweet treat for your Valentine, then I have just the thing for you here. The recipe is very simple to do but it’s still doubly thoughtful because not only have you been thoughtful enough to make them something, but you have been thoughtful enough to incorporate their favourite chocolate bar into it. 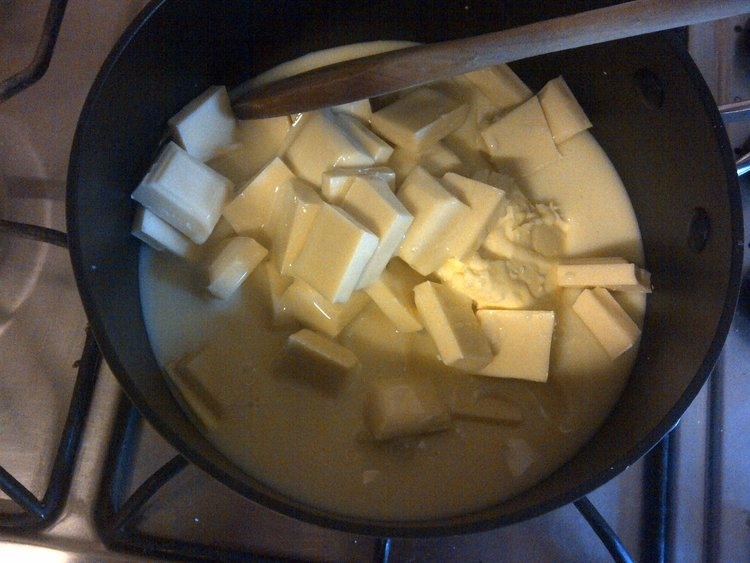 1) Break up the white chocolate and place it into a pan along with the butter, the condensed milk and the salt. 2) Stir continuously on a low heat until it is all melted and smooth. No need to worry about it reaching a certain temperature or anything like that, once it’s smooth, it’s done. 3) Pour it into a lined shallow tray. The one I used is 29cm x 19cm. You don’t want to go any bigger than that because the fudge will be too thin, but you could go smaller for chunkier fudge pieces. 4) Place it in the fridge for half an hour so that it starts to set. 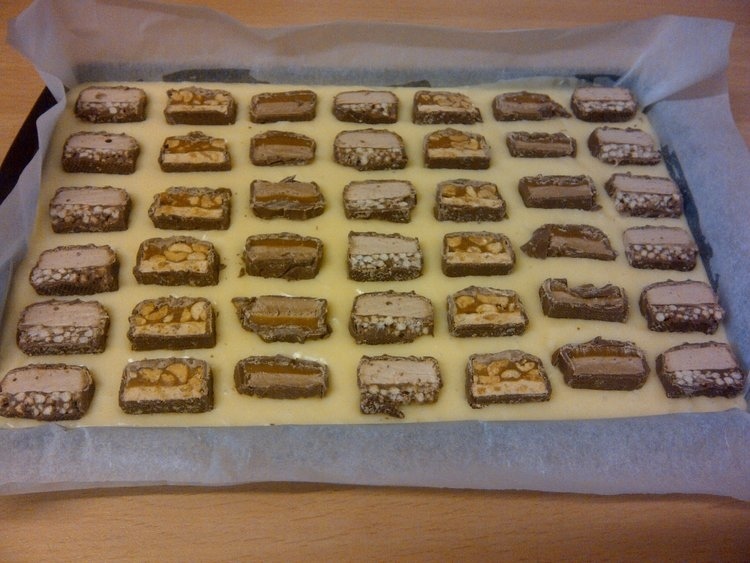 5) Cut the chocolate bars into thin slices. You may find it easier to get a clean slice if the bars are slightly chilled, however if they are too cold then the chocolate can crack up when you’re slicing. Be prepared for a few failed slices which you will be forced to eat there and then. Sorry. Five standard size bars allows for some “wastage”. 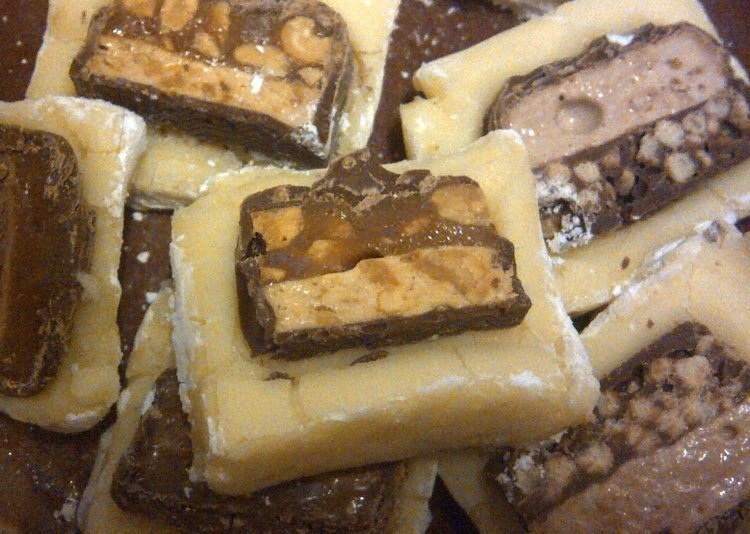 6) Place the chocolate bar slices onto the fudge tray, gently pressing them into the surface, and allowing enough space in-between to cut them up later. We’ve actually used three different types of bar here because they are for three different people. 7) Refrigerate for several hours, or overnight, until set. Cut into squares. If you spotted some powdered sugar in my top picture of the finished fudge, it’s because I was impatient and wanted to photograph it, so I didn’t leave it long enough to set. That’s why I needed some help from the powdered sugar; you probably wouldn’t have even noticed if I hadn’t mentioned it would you, but now you’re going to go back up and have a look. You’re such a sweetheart Vanessa! Thanks for linking back to my Valentine’s Day Recipes! I’m going to link your post to mine as well, if that’s ok with you! 🙂 Thanks a bunch girl! What a clever idea. Did you make this one up yourself? Partly, I made up the bit of using the chocolate bar slices on top – the original recipe used dark chocolate in the fudge base instead of white, and pistachios stirred into the mixture instead of something on top, which I’m sure would be yummy, but I wanted to do something where people could individually personalise it for their Valentine recipient, and so I did the chocolate bar thing and switched the base to white chocolate to make more of a contrast from the slices on top. (Sorry if you were hoping for a yes or no answer! Hehe). Isn’t it fun to change up recipes? That’s when I finally knew I could cook–when I could add my own ‘flavor’ to things. Oh………………………………..my gosh! That looks AMAZING! Thanks Laura. I love white chocolate, so combining white chocolate with a favourite bar in one mouthful is so yummy! It certainly is! …. is there any more? I can sense a sugar rush coming on! Yep, one square and you’ve had enough for the day!